Quantum information describes the new field which bridges quantum physics and information science. The quantum world allows for completely new architectures and protocols. While originally formulated in continuous quantum variables, the field worked almost exclusively with discrete variables, such as single photons and photon pairs. 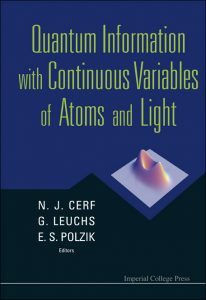 The renaissance of continuous variables came with European research consortia such as Acquire (Advanced Coherent Quantum Information Research) in the late 1990s, and Quicov (Quantum Information with Continuous Variables) from 2000-2003. The encouraging research results of Quicov and the new conference series Cvqip (Continuous Variable Quantum Information Processing) triggered the idea for this book. This book presents the state of the art of quantum information with continuous quantum variables. The individual chapters discuss results achieved in Quicov and presented at the first five Cvqip conferences from 2002-2006. Many world-leading scientists working on continuous variables outside Europe also contribute to the book.